So far, the craziest Volvo concept that somehow made it into production was the 480 in 1986. Anything wilder than that was either cancelled or sent away to become a Citroën, because of course. But this car, the Viking, could have been Volvo’s next P1800. It should have been. Volvo started off the 1950s by building a few concept cars—including a V8-powered American copycat—and coming up with a pretty bad fiberglass roadster called the Volvo Sport, which nobody wanted in the first place. Production came to an end after just 70 units. But the Swedes did learn a lesson there, so the next time around, they went to Italy’s Frua to get some help (and production capacity), only to come up with what’s probably the most beautiful Volvo ever made, the P1800. While the press could see it as early as in 1959, it only reached the dealerships two years later. This is the Frua Rocket concept from 1968, Turin’s idea for a P1800 shooting brake. According to the P1800 timeline on Volvo Tips, the Swedish came up with a bunch of fastback and estate concepts both in house and by commissioning coachbuilders like Fissore, Coggiola and Frua. The fastback idea got canned at an early stage, but while Frua’s wagon didn’t seem practical enough to become a Volvo, their very own Jan Wilsgaard kept working on his design, only to present the 1800ES we all love in September, 1971. While that meant Coggiola’s Volvo Hunter and Beach Car concepts also stayed on the drawing board, the studio didn’t have to give up just yet. Because the P1800 was getting close to its end despite the new version hitting the streets in 1972, Volvo and Coggiola had another surprise at the 1971 Paris Motor Show. 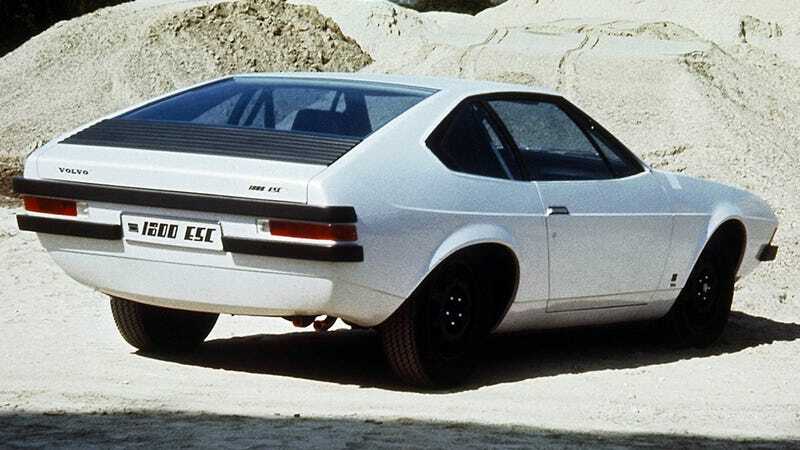 The Volvo 1800ESC, also known as the Volvo Viking, was supposed to be a true successor to the P1800 coupe. The 2+2 had enough room for a bigger engine up front, and was well received by both the press and the public. Was it killed off by the upcoming Oil Crisis, or the too high building costs? Maybe it was just one of those bad executive decisions you see in the car industry all the time? I guess nobody cares, because while the P1800 was done by the end of 1973 due to America’s new safety regulations, Volvo did give the world the 200 Series the following year. The Volvo wagon, a tradition that thankfully is around today still.